Suspected Maoist Rebels Kill 5 in Chhattisgarh Ahead of Polls Suspected Maoist Rebels Kill 5 in Chhattisgarh Ahead of Polls: State Chief Minister Raman Singh, who is seeking a fourth term, said the attack was aimed at disrupting the elections. Suspected Maoist rebels in Chhattisgarh's Dantewada district have killed five people, including a paramilitary soldier, in a restless central Indian state that goes to polls this month. Police said two Central Industrial Security Force (CISF) soldiers were also wounded when an explosive device tore through a CISF bus near Bacheli on Thursday. It was the third such attack in two weeks and came a day before Prime Minister Narendra Modi addresses an election rally in the state. In the prior two attacks, two policemen, four paramilitary soldiers, and one broadcasting cameraman were killed. 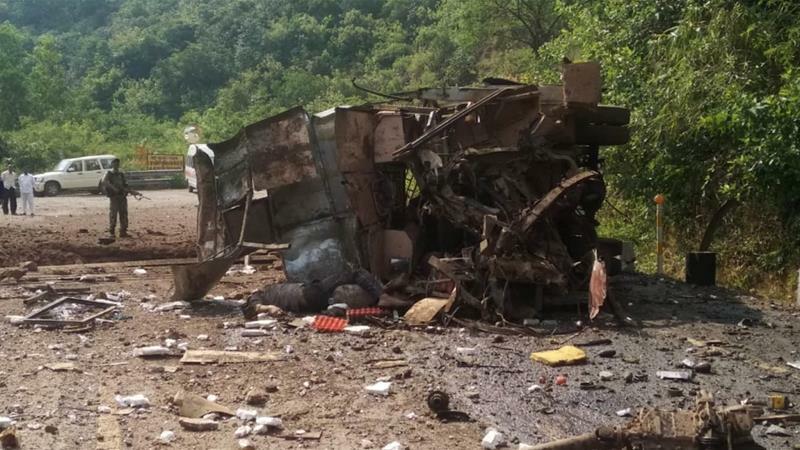 "Maoists had already put an Improvised Explosive Device (IED) along the road to target the bus in which they were traveling. The two injured soldiers are in critical condition," senior police officer Sundar Raj P told Al Jazeera. Chhattisgarh has been governed by the Hindu nationalist Bharatiya Janata Party (BJP) for 15 years. State Chief Minister Raman Singh, who is seeking a fourth term, said the attack was aimed at disrupting the elections. "The attack was planned to influence the election, but the people of Chhattisgarh will give a strong reply," he told Al Jazeera. He further said: "Maoism in the state is taking its last breath, and just to show their presence, they are conducting such attacks." The Chhattisgarh legislative polls will take place in two phases on November 12 and November 20. Eighteen constituencies in the state fall in districts where Maoist rebels are most potent. The Maoist rebels, who say they are fighting for the rights of landless laborers and poverty-stricken farmers, have called on voters to boycott the polls. Kawasi Lakhma, a Congress legislator from the region who is seeking re-election, told Al Jazeera that tribal people are affected the most by the cycle of violence in one of the most impoverished regions of India. "The terror of such events spreads quickly. It is beyond our understanding what the tribals should do. On one hand, the police is killing them [for being suspected Maoists]. On the other hand, the Maoists are killing the tribals," said Lakhma. He said it was "ridiculous" to think that people will vote "without any fear" in such a situation in "a very difficult time". A recent request by Chhattisgarh officials to scrap the use of indelible ink on voters' fingers was turned down by the federal election commission in the capital, New Delhi. However, senior police officer, DM Awasthi, who manages the anti-Maoist operation in the state, assured voters that security would be safeguarded. "Adequate security forces have been deployed for election. People should not be intimidated at all," he said. The Maoists are believed to be present in at least 20 states across India but are most progressive in distant parts of Odisha, Chhattisgarh, Jharkhand, Bihar, and Maharashtra, where much of the population remains involved in poverty and lacks access to critical services. The four-decades-old rebellion is believed to have lost thousands of lives, including a large number of security forces. The government has called the Maoists India's "biggest internal security threat". Critics, however, say the government's attempts to end the revolt through a no-holds-barred military offensive are doomed to fail.